Spektakulær utsikt over Cap Ferrat og Beaulieu. Perfekt Fredelig Pool ferie beliggenhet med utsikt "La Riviera". En unik, moderne, nybygd villa med svømmebasseng, som ligger mellom den berømte "Moyene et Grande" corniche på den franske riviera mellom Nice og Monaco. Den har 3 doble soverom og 3 bad alle vakkert innredet. Et velutstyrt Polyform kjøkken, med separat vaskerom og fullt utstyrt vaskerom. Skjult bort med en landlig tilnærming til denne fantastiske glitrende hvite villaen med store panoramavinduer som åpner for teak-dekk og basseng med utsikt over bukten Beaulieu og Cap Ferrat. Huset og bassenget har sikkerhetsalarmsystemer. flott beliggenhet ..springbrett for å besøke hele den franske riviera .. Monaco 20 min kjøring. It was grateful, the villa is amazing and very comfortable situated to all significant places!!! We had a holiday on this villa in September during 11 days. The villa is very clean, beautiful , comfortable and there are all necessary things what u need in everyday life. Three bedrooms , living room , kitchen, two bathrooms , washing machine, dry machine. 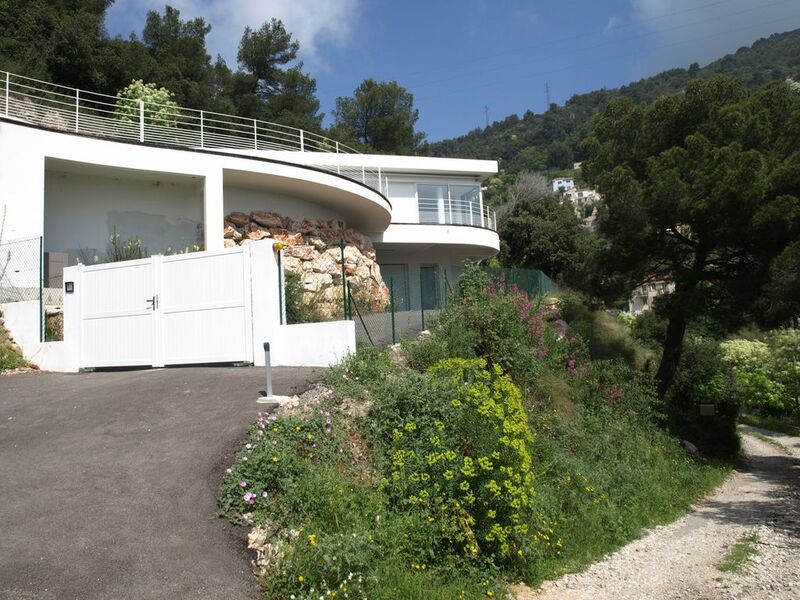 All windows are opened and u can enjoy the amazing view on Vilfranche and Saint Jeanne Cap Ferrat . The only thing you need is a car and u have a possibility less then 10 min to get to all beaches ( eze - anjuna beach, Beaulieu-sur-Mer , Paloma beach at Cap ferrat , supermarket , restaurants, Monte Carlo , Nice . Pam is very kind and help you in everything what you need , her villa is perfect . I recommend it . Thanks for such comfortable staying at your villa . Thank you so much Natali. Hope to see and your family come back one day. We had an incredible stay at Villa Lennerd. The house is beautiful and has every amenity necessary. The pool and view are breathtaking. The house is modern and very well suited for a family stay with full kitchen, laundry facilities, linens/towels, and satellite television. It was such a pleasure to receiving you and your little family. Hope to see here you again! We enjoyed the stay, the house was very bright and pool was wonderful to swim in. Pam was very helpful with some of the challenges we had with the home. Nous avons adoré notre villa d'abord pour sa vue à couper le souffle, pour son aménagement "californien" et pour sa piscine. Nous avons juste regretté le bruit de la circulation sur la moyenne corniche en contrebas et par le fait que la chambre principale n'est pas vraiment close, ce qui oblige toute la maison à vivre au même rythme car impossible de ne pas être réveillé si quelqu'un a décidé de prendre son petit déjeuner...Pamela est une remarquable et souriante gestionnaire de la location. Accommodating a family with 3 generations is usually a little noisy. As I understand it you had an extra guest sleeping in the living space which was not anticipated. However, It was very nice to meet you all. Very nice villa with beautiful views. The impressive pictures you see on the site do not exaggerate how pretty the place is. The deck and the pool are large and sunny all day. Importantly, the air-conditioning is good. The kitchen has all you need and there is a TV with English and French channels. The villa is well situated 15 minutes from Nice, 15 minutes from Monaco and 7 minutes from Saint Jean Cap-Ferrat. (2) the three beds squeak every time you turn and some of us found their bed uncomfortable. (3) In our view the villa is not suitable to house young kids as there is an unprotected cliff not far from the pool. Please ask the property manager, who was very nice and helpful, about the last two points as they may have changed after the day of writing. All in all, we had a pleasant week at the villa. Thank you very much for the feedback and pointing out your issues. We will address whatever we can for the rest of this season. During the 'Grande Prix' the Moyenne Corniche is particularly busy ..otherwise the noise is not usually a problem. Hotellet ligger i åsene med spektakulær utsikt over Middelhavet, Port of Beaulieu og Cap-Ferrat. I nærheten av vakre middelalderlandsbyer og slott, La Turbie og Eze. 15 minutter fra Monaco for Grande Prix, Café de Paris og Star Spangled uteliv. 15 minutter fra vakre Nice ... butikker, kafeer, restauranter, barer og klubber etc ... 10 min kjøring til strender og spektakulære Riviera kysten. There is a 'end of stay' cleaning charge obligatory...200 euro. Supplementary cleaning on request ...if organized in advance. Pets are allowed at discretion of the owner.